Originally launched for the Super Nintendo Entertainment System in 1993, Secret of Mana is a beloved action role-playing game of captivating colors, beautiful music, and unforgettable characters. Two and a half decades later, Square Enix has revisited their old RPG stomping grounds by releasing an updated version of the classic title on Playstation 4, Playstation Vita, and PC. And staying true to the source material, this edition of Secret of Mana is just as charming as it’s 16-bit predecessor. I had played the original Secret of Mana during the glory days of the Super Nintendo; it was one of the first games I had played with a multiplayer feature that wasn’t just a tacked on Player-VS-Player mode. Secret of Mana was a role-playing game that allowed me to progress the story alongside my siblings or friends, making my first experience with the game a special one. So when I had heard Square Enix’s official announcement of the remake in August last year, I was absolutely ecstatic and couldn’t wait for it’s release. Just like the original, the remake doesn’t hesitate to throw you right into the fray. It introduces you to the world with two very brief cutscenes, there’s no waiting through long-winded explanations; everything is kept short and to the point and you begin fighting monsters and adventuring almost immediately. 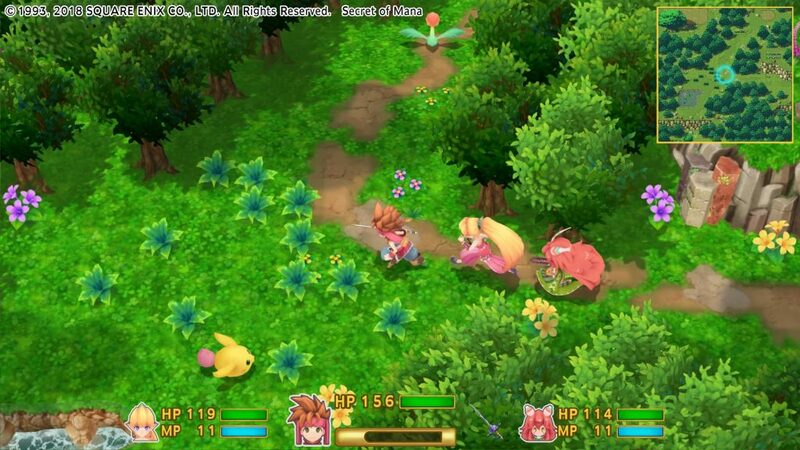 While Secret of Mana has some room for exploration, it’s immediately apparent that the game is extremely linear. You spend a lot of time following predetermined paths, some with roadblocks that only lift when certain requirements are met. 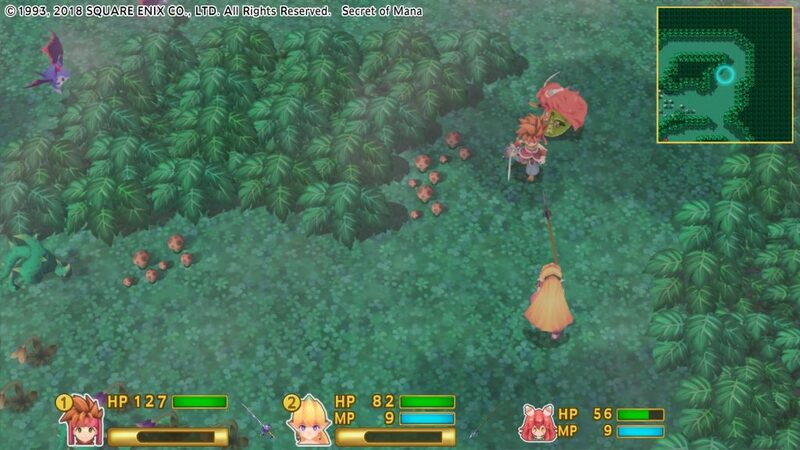 Fans of open world exploration in RPGs may find this remake to be a little frustrating in this regard, as Secret of Mana follows the same old-school railroaded RPG formula as it did during its run on the Super Nintendo. Players will also find that there are moments where scenes behave like they would on a Super Nintendo, with walls suddenly appearing without explanation after stepping on a button, or NPCs walking into the corners of buildings aimlessly. While I found these unchanged features to be enjoyable and cute from a nostalgic perspective, players who are unfamiliar or aren’t fans of older RPGs may find this to be a bit weird if not disappointing, as it can make the game feel a little outdated. The artstyle for Secret of Mana was what captivated me the most about the game, it was vibrant and clean, the animation was smooth and didn’t have any graphical lag. The character and monster designs were chibi-like, making the overall aesthetic very cute, fun and light hearted. Every character, random townsfolk and beyond, has their own voice to suit their personalities, breathing new life into the world. Seeing the game in this new light brought me the same joy it had when I played Secret of Mana on the Super Nintendo. And that feeling of happiness only increased when I revisited familiar locations or the moment I stepped into an item shop and laughed because I had forgotten about the quirky dancing shopkeepers. Voice acting was one of the bigger changes made to Secret of Mana, and I started the game with the English cast, but found myself switching to Japanese only shortly after. The English was a little too cheesy for me to handle, and the Japanese voices were much easier to listen to, as the acting seemed a little less forced and more emotionally driven. I was also disappointed to see, however, there was absolutely no lip animation during major cutscenes. Their facial movements are stiff, with their expressions only changing based on their emotions. It was a little jarring at first, since the game comes across so beautifully, only for it to fall flat on facial animation. Switching the languages also revealed something quite interesting that I found myself experimenting with out of curiosity. The players can change the names of the protagonists to anything they want, and doing so while the voices are set to Japanese results in the names being beeped out in cutscenes, but keeping the original names results in them actually being spoken aloud. The English cast doesn’t address the names of the protagonists at all outside of text, and spoken sentences are structured to work around saying them, which is a little weird if you’re not used to that kind’ve thing from other RPGs. These subtle differences between languages can give players a different experience depending on the setting they choose. I found the gameplay itself to be fluid and easy to figure out, however, since I am also familiar with the Super Nintendo version of the game, so it was mostly a matter of remembering mechanics. There is no tutorial, so it’s more trial and error for new players, with weak monsters in the beginning zones and an easy first boss battle to help players figure out how combat works. Monsters roam freely in the world and you can avoid them by simply running passed them, or you can choose to engage with them by striking them. So there isn’t the worry of running into a random battle every few steps, which is nice. Secret of Mana’s combat is active, with elements of a turn based system via a stamina gauge. So while button mashing is allowed, the game encourages players to wait for their stamina gauge to fill up after each attack. If the stamina gauge is depleted, you’ll do less damage against monsters, if it’s mostly full, you’ll do more damage. Because of this, the combat can feel sluggish, as you spend a lot of your time waiting for the stamina gauge to fill and can make grinding levels a little exhausting. There was also a moment where I began a boss fight and my screen went black. The game was still running and responding like normal, and the health bars were still present at the bottom of the screen, but I just couldn’t see anything at all and it took resetting the game to fix this issue. Thankfully Square Enix seems to be very much aware of this and many other issues players have been having, and are planning to patch them out. While the game leaves room for you to customize how your party members behave in combat, I found that the A.I. was a little unreliable at times. The party members would stand around while waiting for their stamina gauges to fill up, which resulted in them taking unnecessary hits. This led to me feeling like I was wasting healing and revival items on occasion, as the A.I. just didn’t know how to move out of the way of enemy fire. Some amount of levels and armor managed to counter this, simply because they had health then to stand in the middle of a warzone carelessly, and not because they knew how to step to the side to avoid an incoming arrow. Navigating the inventory was simple at first, but after unlocking the full party, it got a little confusing. The game doesn’t outright tell you who’s inventory your looking through with a name or small icon, rather, it shows you by changing the color of the item selector to match the character. And it seems I am not the only one who had issue with this, as the developers have plans to patch in new icons to make cycling through the Command Ring much easier upon the release of patch 1.02. Something else I found a little tiresome was if a character was in the middle of an attack, their inventory could not be opened at all until the attack was completed. So if you’re reacting quickly to a situation, you may have to wait for the game to catch up first if the A.I. made other plans before you could access their magic. 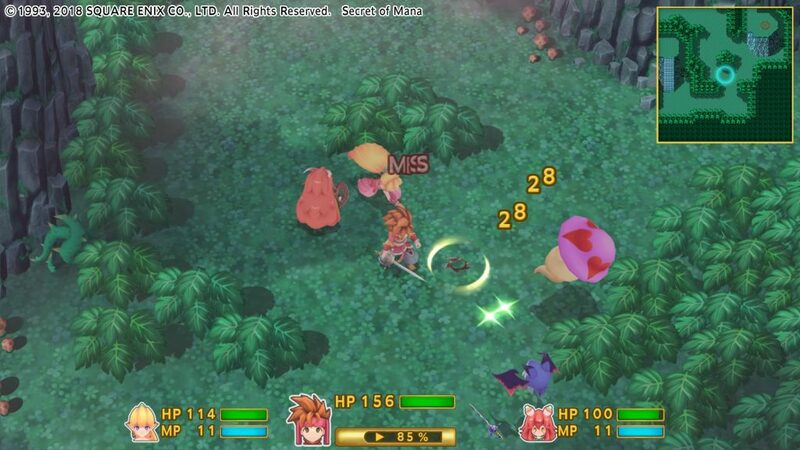 Secret of Mana’s multiplayer feature does make a return in this remake, and allows for players to take control of the two party members you unlock, allowing for three players total on one screen. Playing on Playstation 4, activating the co-op feature was relatively easy; just have your players log onto their own Playstation Network account and switch back to the game. After that, your friends can choose what character they’d like to play, and access the inventory to swap weapons and utilize healing items. Icons on the bottom of the screen will indicate which player controls what character, and for PS4 players, the light bar on the controller will change color depending on the character you play–which I thought was extremely cute–and will match the item selector in your inventory, which was helpful. The co-op feature isn’t completely chaotic like most co-op supporting games these days tend to be, as there isn’t any friendly fire, but there is room for players to troll one another utilizing the limited camera movement while in this mode. When two players try to go in two different directions, they’ll be met with an invisible wall, which can lead to some ridiculous, if not hilarious, situations. Because everyone is playing on a single screen, players can get stuck behind statues or in corners if one player runs too far ahead. So while fighting monsters becomes slightly easier with friends, strangely enough, the camera is what levels it back out and makes the game challenging, as it promotes lots of teamwork. Multiplayer is not a necessity to beat the game either, rather it’s an extra feature that allows friends to play an RPG together for the fun of it. Unfortunately, there is no online support for this feature, which is a shame. And of course, I couldn’t get through this review without talking about the music. All the original themes are back and redone in unique and fun ways, adding new energy and adventurous tones to the already lively songs. Some of the themes have a celtic-like flair to them, other are bubbly remixes that put a smile on my face. And, of course, the beautifully orchestrated opening theme on the main menu brought on a wave of nostalgia, and I think any veteran fan of Secret of Mana will appreciate starting up the game for the first time. 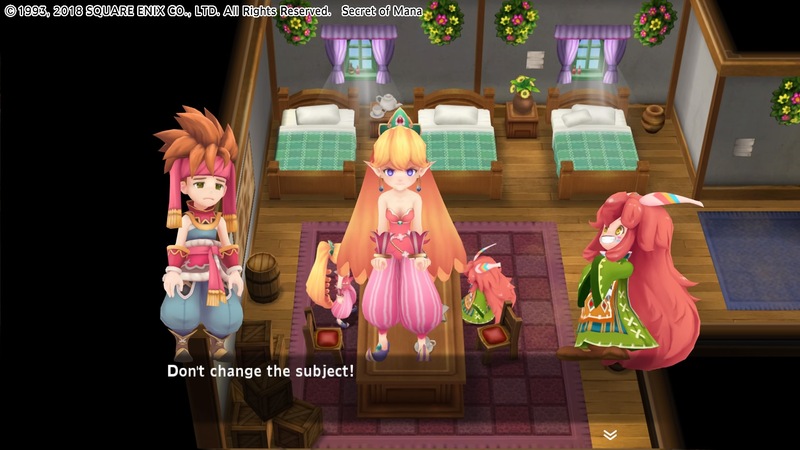 Overall, if you enjoy bright colors, quirky characters, bizarre plot resolves, adorable monsters and and a traditional JRPG with a charming story, then you may want to give Secret of Mana a try, especially if you’re looking for a new game to play around in, or if you’re a returning fan looking to relive some nostalgic moments. But if open world RPGs or storylines with repercussions and choices are more your cup of tea, then you may find yourself wanting more out of this former 16-bit Super Nintendo action RPG. Optional Co-op feature adds a new layer of fun to the game. Extremely nostalgic and true to its SNES roots. Can feel a little grindy at times, and thus slow. Has a very old school RPG vibe to it, and can feel outdated because of it. A.I. is not too bright. Secret of Mana is available now for Playstation 4 and Steam for $39.99, and on PSVita for $29.99. Disclaimer: A review copy of Secret of Mana (PS4) was provided to Nova Crystallis by Square Enix, the publisher. Posted in Headlines, Previews, Secret of Mana and tagged Review, Secret of Mana. About the music, Hiroki Kikuta launched an arranged soundtrack, called ‘Secret of Mana+’, a 40 min long theme with elements from the game music. I was thrilled when I discovered some of those tunes in the remake soundtrack. One of Square’s games that didn’t age too well imo. I agree with the review for the most part: gorgeous game, slow gameplay.